Transforming diagnostic imaging practice through software that breaks information barriers (and old habits). As a user experience designer for the University of Pittsburgh Medical Center (UPMC), I have spent the last two years creating the next generation of software systems for imaging specialists around the world. At the core of it all is a clinical question: how can software better enable a doctor to translate an image into a diagnosis? But just as the human body is a multidimensional system that is sometimes difficult to diagnose, the realm of medical imaging is a vast network of systems, services, knowledge, and people, and the largest problems to solve are not always on the surface. What is the reason for this exam? An image excerpted from a story I wrote and illustrated points to the challenged faced by collaborative care teams trying to order appropriate imaging exams for their patients. HOW CAN WE PREDICT WHEN DATA WILL BE HELPFUL? Above is part of a study I ran with radiology residents, investigating how the questions radiologists ask themselves change from the moment they open a patient's imaging study to the time they are finished interpreting it, as well as the documents they use to answer these questions. WHEN WE HAVE ALL THE DATA, HOW DO WE SHOW IT? A wall full of concept sketches produced during a brainstorming session with design, product management and engineering. CAN WE Leverage HOW MEDICINE IS TAUGHT TO IMPACT HOW IT IS PRACTICED? A screen from a small web application I designed to further investigate how electronic medical record (EMR) documentation could be categorized in more meaningful ways for radiologists. FIVE IDENTICAL TASKS, SIX SEPARATE WORKFLOWS. Synthesis of an activity where we asked radiologists to color swim-lanes to indicate when they perform certain tasks while interpreting images. While the same tasks are almost always needed, they can be combined in many ways depending on environmental pressures. Diagnostic imaging is the workhorse of medicine, relied upon to provide evidence for damage or disease. The high volume of exams ordered each year accounts for an enormous percentage of healthcare costs, and with recent economic initiatives targeting a push from volume to value, providers are increasingly seeking new methods to understand the impact that imaging has upon patient outcomes. And although the current generation of software systems is fraught with inefficiencies, truly innovating in this space requires holistic attention to the physical, economic, & service landscapes in which these physicians work, their collaboration methods, and their information models. It also helps to know a thing or two about medicine! I work extensively with product management, business analysts, clinicians, and software engineers throughout all stages of the design process, including strategic visioning, exploratory research, conceptual design & validation, high-fidelity mock-ups, prototyping, and usability testing. With more than 200 radiologists and other physicians at our fingertips, as well as access to UPMC's wealth of clinical data, the research we conduct is ongoing, in-depth, and both qualitative and quantitative. What follows is a small selection of methods I've used and artifacts I have created to support the implementation of products across several globally distributed agile development teams. The project began in 2013 with a very small team, few of whom had any prior experience in the field of diagnostic imaging. As the only designer at the time, I wanted to quickly but intimately understand the domain, and also to unify the team around a backbone of concepts that could lead to further research. I decided to craft a vision piece that illustrated the journey of a patient named Grace through a mammography, and subsequent biopsy procedure. The story was eventually presented by our development partners at the 2013 RSNA Conference in Chicago. 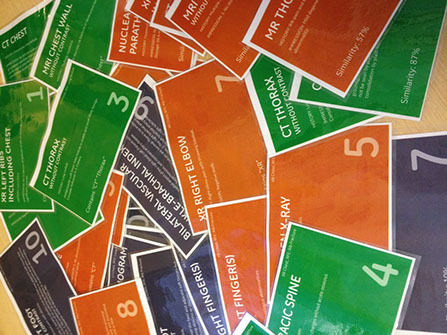 These screens are excerpted from the 2013 vision story I created to showcase the challenges and opportunities in the domain of diagnostic imaging. Constructing a story of the future was a 4-month process that began with capturing the here-and-now. I shadowed radiologists, technologists, administrators and nurses during all aspects of their jobs in the women's imaging department of Magee Women's Hospital. 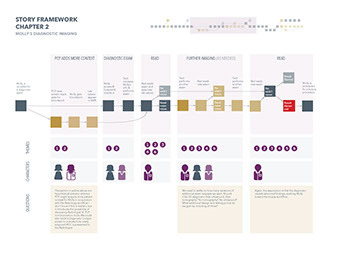 These observations led to workflow diagrams—at first simple sketches, but later high-fidelity, digital maps—that enabled me to have in-depth discussions with key clinical and business stakeholders. 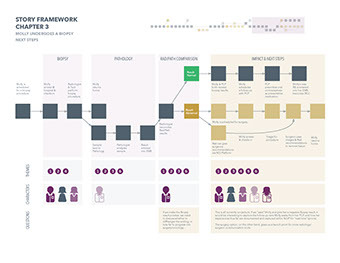 We spent hours collaboratively building upon these workflows, calling out pain points, and highlighting key areas where better processes and software systems could make a huge difference in care. After these discussions, I withdrew and transformed the content I'd collected into block outline that showed what the same experience would look like if all opportunities were addressed. I then wrote a script that layered characters, environments and data over the narrative skeleton. I continually reviewed the script with radiologists to verify that the story was clinically accurate, and that it was, in fact, their story. 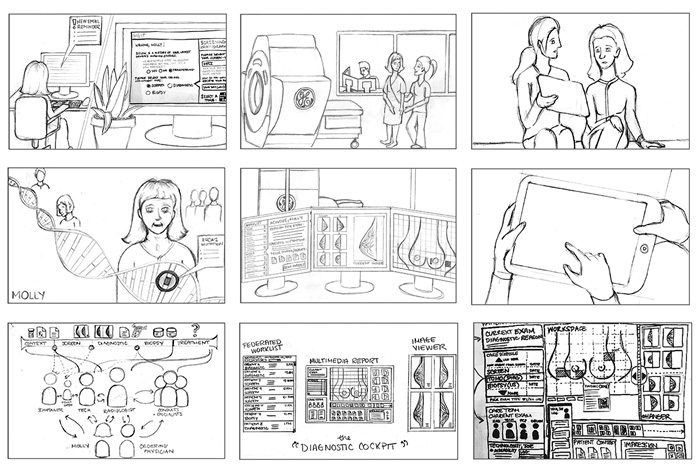 The progression from workflow to block outline to hand-sketched storyboards while iterating on the women's imaging vision story. Radiologists are specifically trained to look for abnormalities in images, which means they have a blueprint in their minds of what a 'normal' body looks like, and they scan images in highly predictable 'search patterns' looking for anything that deviates from the baseline. 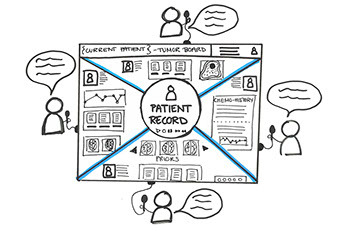 I've found this makes radiologists ideal 'users' or even co-designers for a UX team, because they are often exceptional at viewing their own behavior from different perspectives, understanding their place in broader workflows, and identifying interaction and data visualization patterns that solve whatever problem is at hand. Over the course of the project I have worked alongside a team of designers to construct and run countless of research and validation exercises with radiologists. We even have a fully functional radiology reading room within our office, which means that our users are literally at arms length, completing their daily work as they normally would at a medical center, and using both current and next gen software to do so. 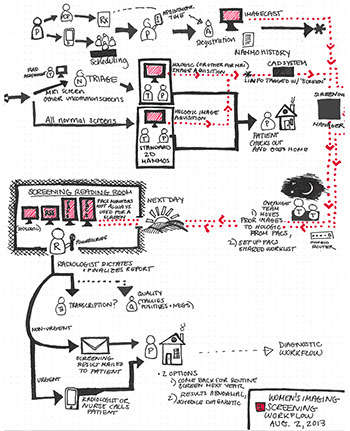 TOP: Examples of hand-drawn concepts that were used during an early "speed-dating" idea validation exercise. 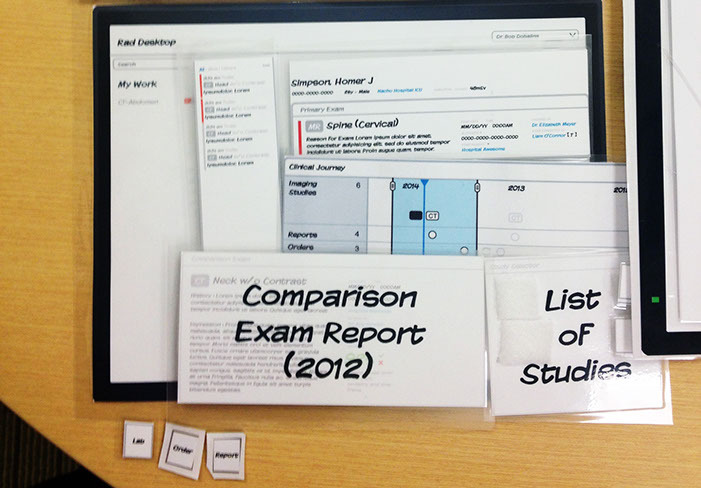 MIDDLE: Photographs of a card-sorting activity aimed at exploring how radiologists decide what exams to use as comparisons for their current study. BOTTOM: One radiologist's arrangement of a physical prototype of our software system. The pieces were created using laminated paper and could be attached to each other in many different configurations using Velcro. Despite the wealth of opportunities we have to do research in our setting, at some point, the exploration must end and polished concepts need to be delivered to developers. Our design team works with more than half a dozen globally distributed teams comprising engineers and business analysts from UPMC as well as our partner. We provide them with whatever content they need in order to build pixel-perfect implementations of products, whether it be visual design specifications, annotated wireframes, or even small click-able prototypes. While I am unable to show finished designs for the commercial products, high-fidelity screens I created for a research application can be found below. The Mimir application—named after the Norse deity, and standing for “Memorizing Imaging Information Relevancy”—is a prototype that aggregates information from several clinical document sources, and tracks what content a radiologist accesses while interpreting a patient’s imaging. The UI was designed and implemented rapidly, but seeks to be simple and to-the-point, emphasizing the user’s rating of information through common methods, such as "liking" or the 5-star system. We hope to use this information in combination with our qualitative research to create products that can deliver the right information to radiologists at the right time in their workflow. ALL THE CLINICAL DATA RADS NEED, IN ONE PLACE. Wireframes used to develop Mimir, a research application that consolidates a patient's clinical documentation from multiple source systems, and allows radiologists to rate how well each accessed document aids in their interpretation of images.